A collection of 300 aphorisms from one of our most prominent contemporary essayists. Manguso ties her eccentricities to brief statements that are intended to outlive her. Her book is only 90 pages long, and can be digested in a single sitting, but it also beckons the reader to return, to read a sentence, and put it down again ... These statements feel like they have maybe always existed; like they came from an oracle. What makes Manguso’s book feel so surprising, however, is that she quickly veers away from these more decisive observations into idiosyncratic personal memories ... If there is any point at which I bristle at Manguso’s lifelong enthusiasm with being brief, it is that she regularly equates excess with vulgarity...There is a romance in this—the perfect book, with no gristle on it—but also it implies that there is something obscene about writers who choose to give in to their hunger and go long on a subject ... Manguso’s need to write short has sharpened her lines into diamonds, but it has also driven her slightly mad, and it has caused her to perseverate over words to the detriment of her happiness and, as she admits, her health. These arguments are forged out of hard work and sustained effort, and also out of pain. It is impossible to read them without feeling for her; for what it took to write on such a tight leash. In the singular, any one of these might be on a refrigerator magnet or hung above your desk. Together, Manguso's 300 mysterious clusters leap and circle the question of what we do when we read or write or desire. 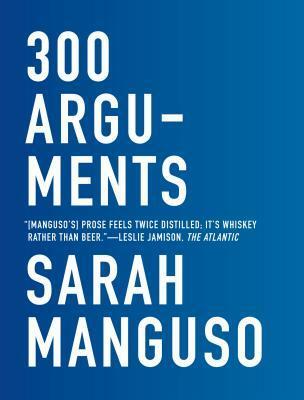 So even though the cover calls the book nonfiction, this collection transcends any category to be something totally its own ... Manguso's captured the argumentative voice of a mind sifting through a problem, circling it, animated by sorting it out. In her wake, Manguso sets problems for us to sort, as well. No one can steal something that's too small to see, says Manguso, and immediately I find myself wondering whether I think that's true. I'm not sure, but I admit I like thinking about it, and maybe that's the pleasure here ... We enter Manguso's mind - her puzzle, pleased to be puzzled, too. Her biting collection of aphorisms merits a wide audience, especially of people taking life on the Mithridates plan of self-inoculation against the world's toxins. But be forewarned that Manguso's bracing words often suggest those toxins are self-generated ... She offers a master class in a specific strain of desire: envy, the (often resentful) longing to have what someone else has. To rip off a Chris Hedges title, for Manguso sometimes envy is a force that gives her life meaning ... My field test for writing like this: Does it produce a rueful inner smile or shudder of recognition? Manguso's arguments do so many times. What did you think of 300 Arguments?